This month begins with a man known for vanishing Puerto Rico's Capitol Building and is the current world record holder for fastest straitjacket escape. Reynold Alexander joins us At The Table for a lecture like no other. This lecture includes some original effects, but dives heavily into variations of timeless classics. Reynold proves that by tweaking effects slightly, you can achieve far more convincing effects and evoke stronger reactions from your spectators. The month continues with a wonderful creator, magician, and lecturer, best known for his creations in magic, two bestselling books, and the founder of the Oporto Magic School. With more than 20 inventions, like the Vision Box and Lynx Smoke watch, João Miranda's creations have been performed by the world's top magicians on both television and live shows. Now he brings that creative ingenuity here At The Table. Join us as he teaches 10 amazing effects, everything from close-up card work to hilarious stage and parlor acts. Two amazing magicians for one incredibly great deal. 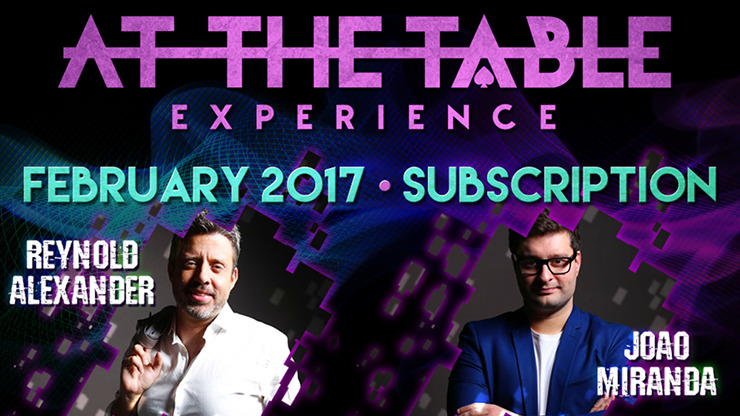 Join us as we sit down with Reynold Alexander and João Miranda for their lecture At The Table!